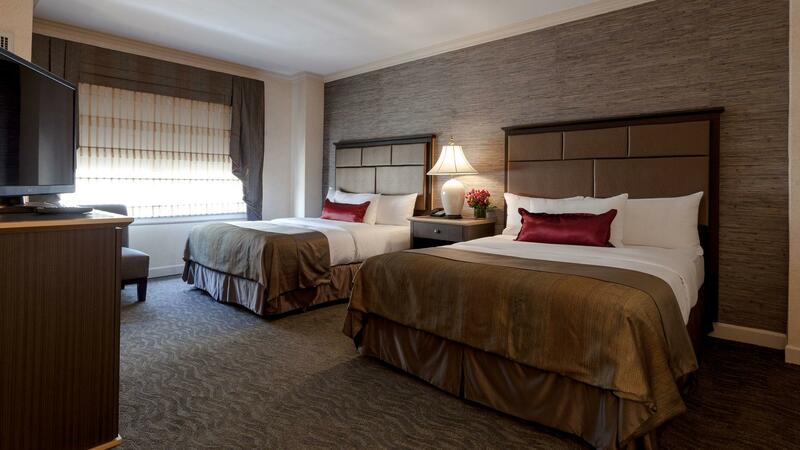 Our spacious Superior Double Queen Room is the perfect base for your Chicago vacation. This hotel room in Chicago is designed for accommodating up to four guests. These quarters feature new custom designed furniture, writing desk and original art work, premium Egyptian cotton linens, white silk duvet cover over goose down comforter, exclusive cashmere Hypnos mattresses, Whitehall signature plush robes, mini-bar, in-room safe, 42-inch high definition LED television, premium TV channels, Netflix & Hulu available with membership, cordless phone, marble bathroom with hand-placed onyx mosaic tiles with shower and soaking tub, vanity and luxury bath amenities, and all the essentials.